Ideally, every day of life would be a Thanksgiving play. And yet, sometimes we forget to be thankful for all the chances, the lucky coincidences, the synchronicities and lessons we receive. The trick of living is to give thanks in every single case in life, whether we like what’s presented to us or not. For the truth is, we cannot control or monitor everything that happens in the world. Our homes are our temples quite often, so perhaps we want to do something about them, to fill them with enough light and grace so that they serve their purpose well. Decorating is important for it transforms our state of mind, it changes the direction of life sometimes. This Thanksgiving we have another opportunity to express what we wish to see in our life. Let’s intertwine tasteful ideas with lovely decorations, change the atmosphere and see what happens in twelve amazing ideas. Festive, cheerful, colorful and filled with all the season’s essentials. So much is happening here, we need to take a look in detail to see the organization. The whole perspective on the holiday is expressed on this table. 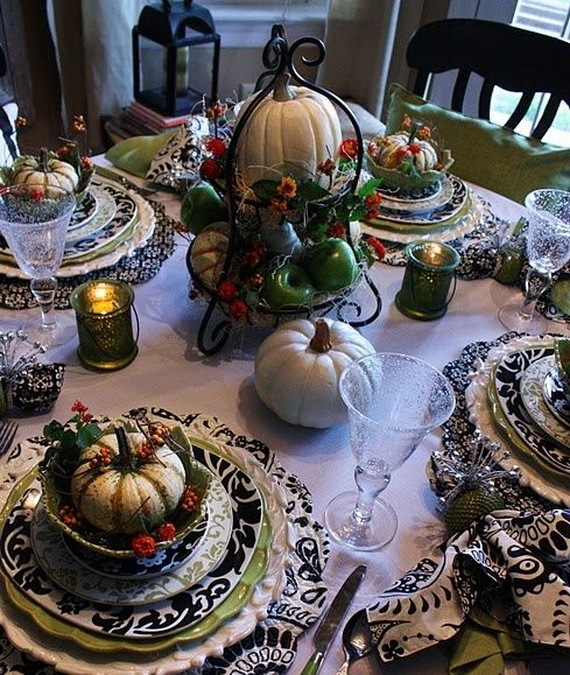 Take a look at the soft orange plates, the white wine in the glasses, the lighted candles and the cute little squashes on the plates. Surely, we can be thankful for a table like this. All these create a stunning fall season centerpiece. Especially if we have prepared it ourselves, then we will know how much we appreciate it. Sometimes we are weak, sometimes we are strong. This season, our strength comes also from the choices we make. The words we hear the most in life is normally our own name. What if we choose to grace its presence for every single guest on the table? Wouldn’t it be a kind gesture and a special personalized touch? I think it is a special feature and it’s definitely something more than the usual table setting. 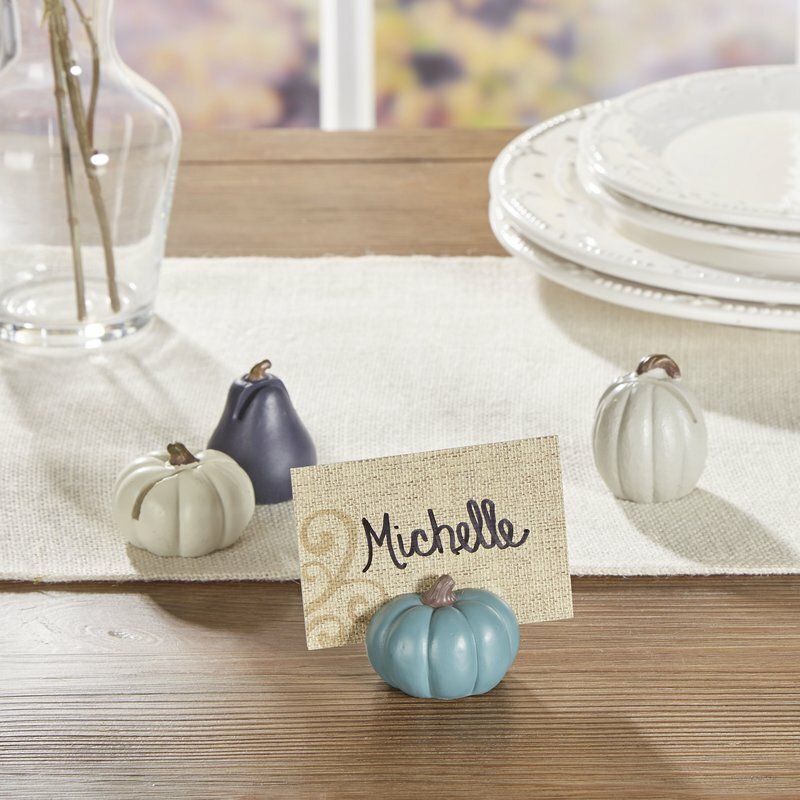 Use a little squash or something small that will keep the name card and your guests will feel blessed. On our way to the next home! 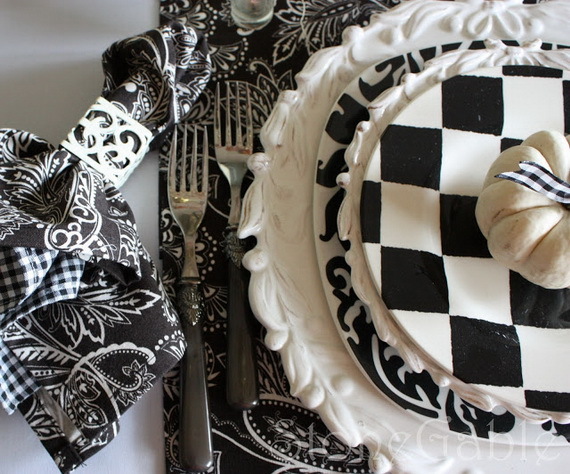 Let’s see this fabulous black and white setting, it’s worth to appreciate a classic look that often reminds us of a chess board. A simple white cloth squashes on top – it’s the seasonal greeting we have all been waiting for. Life runs through, the kitchen is open for business and we are ready to celebrate. How can it get better? The right members of the clan need to arrive and liven up the whole decor. 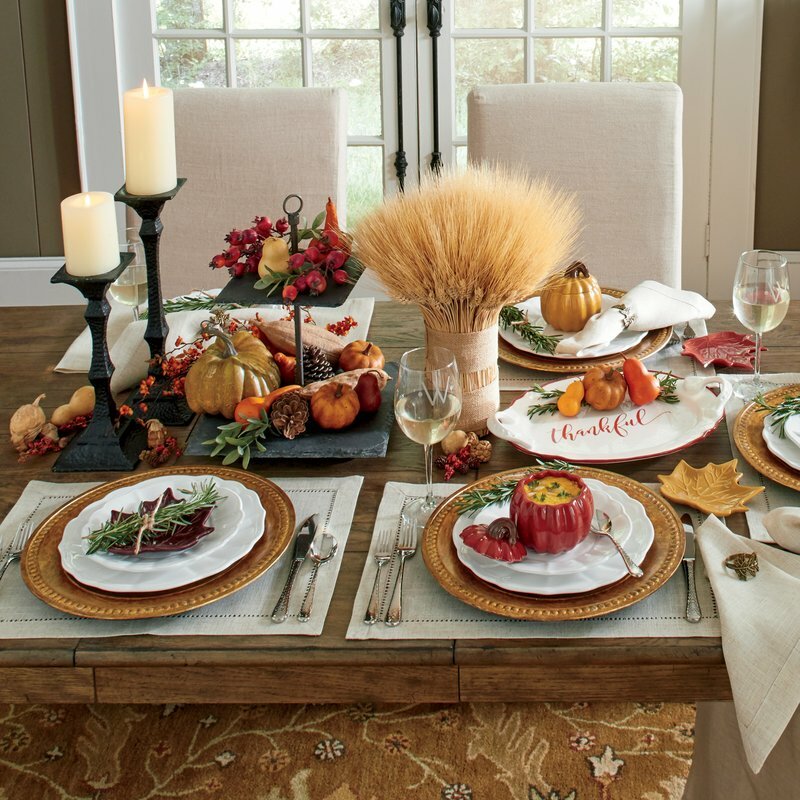 Fall is the season of wonder and this particular table is a good presentation of what this can be. 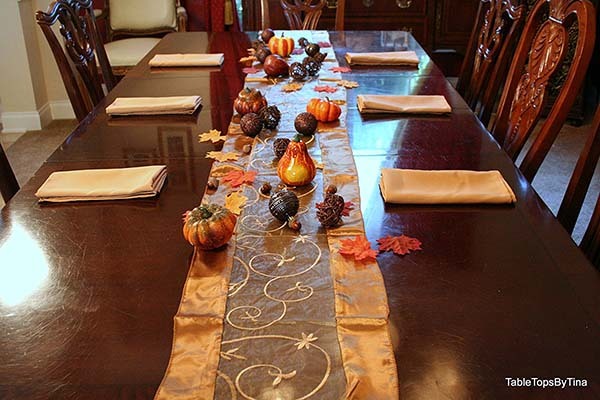 The top of the table is covered in leaves, little elements, and squashes. 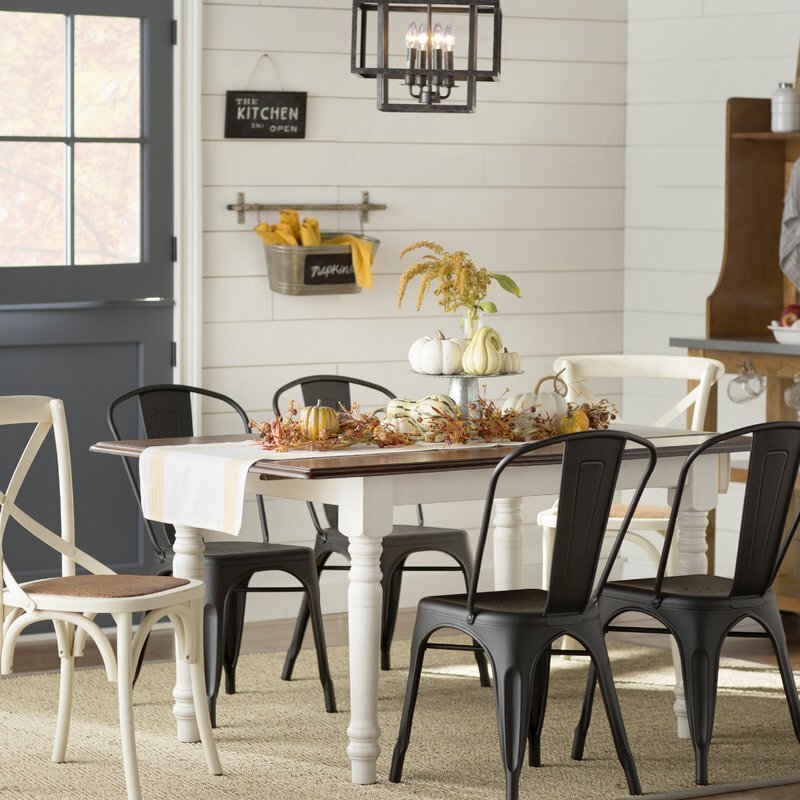 Make the dining room shine and add anything that suits your taste and holiday spirit. Whether it’s big or small – it doesn’t matter. There can only be enough to hold the holiday steady and step into the wonderful season. 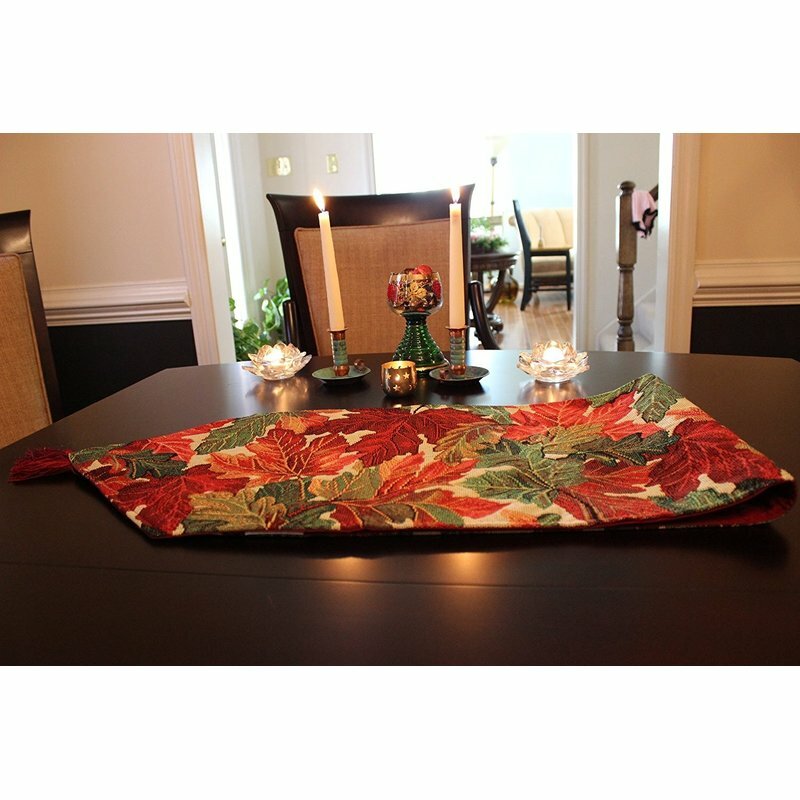 Holidays are the right time to get our every single candle out there and place it on the table. It will not be too much, don’t worry. The special atmosphere is a key, it’s a conversation starter, it soothes us and strips of the tiredness. When you see the light coming from the candles you feel thankful for the warmth and truly enter the spirit of giving. Pretty special, charming and wonderful in its own way. This is a really cute way of encouraging your guests. Sometimes when we gather in a large company, people become a bit shy and need time to warm up. An inspirational saying is always a good thing, it can lift up the atmosphere and truly encourage the start of Thanksgiving. 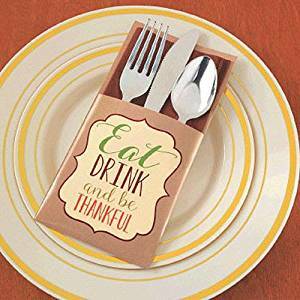 This is relatively inexpensive decor and you can always switch to a good napkin or other tiny cards. 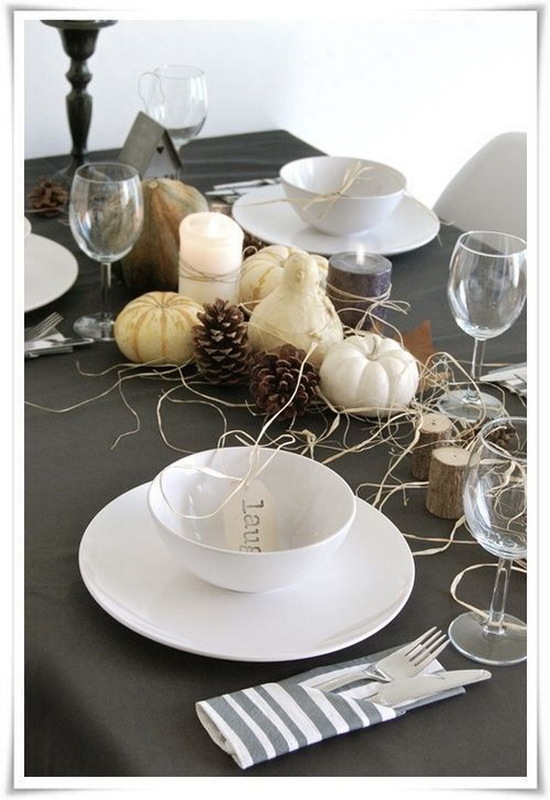 White and gray are a classic choice for a color scheme when we think of autumn holidays. Nature outside is so abundant and it shines in all its glory, so we can afford a little bit of difference in our homes. Striped napkins, white dishes and wonderful guests to come – what else is there? Purple candles, the light coming from the window and some time to reflect on the good things in life, rethink our philosophy and take on the world. Needless to say that this is a pretty gorgeous setting. Take a look and see how these lovely items play together. 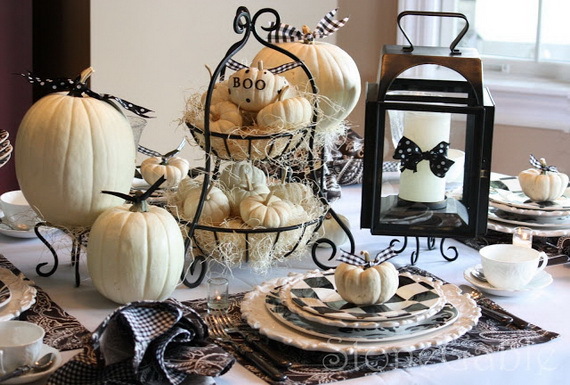 Lanterns, pumpkins, great cups and little squashes. Put whatever you want on the platter, the choice is yours. The best thing we can give is what we have already created within ourselves. Then giving becomes natural and effortless, it does not feel forced or as if it is meant to be pictured. The Allice in Wonderland theme is transferable to many holidays, thematic parties and stylish sessions for social media. Number nine on our list represents a fancy example of how you can make a really festive dinner or lunch. The best part of it being is that the theme of Alice adds so much character and style. It sets up a dramatic decor and you can be artistic together, play with life a bit. Fairy tales bring the keys to reality. 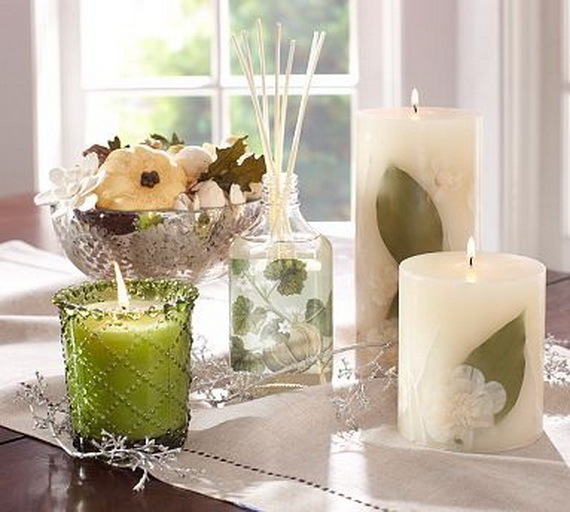 You can buy boutique candle sets from almost any shop now, you can find much better options in small production lines than in the industrial places. What is adorable about these is the amount of effort and special attention that goes into making them. Pick different colors, while still maintaining the whole look of the scheme. Don’t worry about what’s good in the magazines, this is your home and you can tailor any trend. This table reminds us of the movie scene where there are witches, goblins and other mystical creatures with unclear intentions. It’s a very Halloweeny table if you ask me. Buy napkins that are different from what you did last year and make sure the family albums will be filled with variety and new reasons to smile. It’s pretty simple – you need a delicious dish, a good glass of wine and all the imagination you can tap into!